EPFL researchers devise a design guide for future graphene-based chips; UCLA researchers create nanoscale structure for computer chips that could yield higher-performance memory. EPFL researchers have developed a “how-to” manual for making the most efficient optical graphene circuits possible that facilitates and accelerates technological development in this future field. Graphene holds great promise as the basis for new chips that are faster, better-performing and more compact. For example, graphene makes it possible to design systems that can either block electromagnetic radiation or allow it to pass, producing digital information analogous to the 1s and 0s of transistors. Up to now, it has been impossible to predict in advance these circuits’ top potential efficiency. The two parameters that influence performance are the quality of the graphene, which depends on its atomic-scale structure, and the design of the circuit, which includes the other materials in the circuit, its geometry, and so on. Now, researchers have developed a new approach which allows the conclusion that the maximum theoretical efficiency of the system is solely a function of the quality of the graphene. By playing with the design, it is possible to approach this ceiling, but there is no way it can be surpassed. The scientists have thus managed to develop a method for precisely determining which design is the most appropriate for a given quality of graphene. This theoretical approach has enormous practical consequences, the researchers said, who are effectively providing companies and researchers with a clear methodology to optimize their graphene circuits. Researchers at UCLA have created a nanoscale magnetic component that they believe could significantly improve the energy efficiency and scalability of computer memory chips. The design brings a new and highly sought-after type of magnetic memory one step closer to being used in computers, mobile electronics such as smart phones and tablets, as well as large computing systems for big data. The asymmetric structure allows it to better exploit electrons’ spin and orbital properties, making it much more power efficient than today’s computer memory. This work will likely provide a powerful approach for engineering new nanoelectronic devices and systems. In conjunction with related types of magnetic devices being studied by the team, it represents a tremendous opportunity to realize higher performance memory and logic for future instant-on and energy-efficient, green electronic systems, explained Kang Wang, the Raytheon Professor of Electrical Engineering at the UCLA Henry Samueli School of Engineering and Applied Science. Spintronics-based computer chips use magnetic materials for increased power efficiency. The process that allows computer memory to be written — or computing functions to be performed — is triggered when electric current “switches” the polarity of an adjacent magnetic material. In existing spin-orbit torque devices, this process usually needs an adjacent magnetic field to fully complete the switch. The structure devised at UCLA eliminates the need for an adjacent magnetic field. The researchers instead created an effective magnetic field by varying the angle of the structure by just a few atoms, in a shape resembling a cheese wedge: thicker on one end and sloping downward to a thinner edge on the other end. Although the height difference between the two ends is only a few tenths of a nanometer — or a few billionths of a meter — over the length of each device, the new configuration generates significant additional spin-orbit torque, which could potentially use one-hundredth the amount of energy used by the chips in today’s consumer electronics. 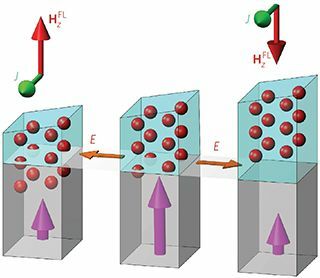 The researchers observed the magnetic-field–free switching effect in several experiments, but the mechanism that allows the asymmetric geometry to improve magnetic switching is still under investigation.